Creative Process #1: Why Whiteboard? What’s your creative process? Reading Tyler Cowen‘s “Create Your Own Economy” and Temple Grandin‘s “Thinking in Pictures” has inspired me to look at my own creative process and to examine the ways in which I do and don’t think like my peers. Let me start by stating that I think that a diversity of views is essential and that I don’t have the monopoly (or even the best) method of creating — but it is my own — and that I’m going to use blogging as a method of exploring that process. One of the best ways that I create is on a dry-erase whiteboard. Whether the whiteboard is small or the size of a wall, there’s something about the surface that challenges me to think big, to fail quickly and fast, and to collaborate easily with others. In short: whiteboards give me all of the qualities of a successful entrepreneur or project leader. So what it is it about whiteboards that makes this process possible? The first reason I whiteboard is that it encourages real-time thinking. How many times have you started an idea, a blog post, or a project, only to find that when it came out of your head it was really only half done (half-baked, sometimes)? Whiteboarding gives you a safe space to work those ideas out as they are happening, to add from here and subtract from there, and to say the idea out loud. Sometimes it gives it more weight; other times, just helps you to realize the idea wasn’t that great after all. This one’s probably obvious, but pictures are much stronger carriers of emotion than words. The old saw not withstanding, a picture is worth at least 500 words if not 1000. If you can’t think about what you’re trying to say in pictures (and you’re a visual thinker like me) then you’re in trouble. For me, drawing a picture helps me to think about the problem in a different way and to abstract more complicated ideas in terms that are easier to explain. It also helps me/cues me to be consistent about the terms I’m using so that I don’t distract the reader/viewer with new ways to say/explain the same thing. Why Whiteboard, Reason #3: Make Mistakes. Try Again. 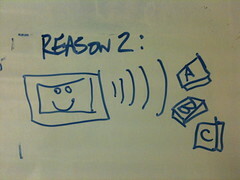 Reason 3 is a pretty obvious corollary to Reason 1, but is different. 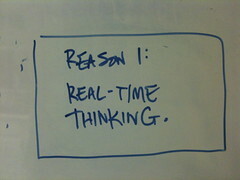 Reason 1, Real-time thinking, implies that you’re going to keep working on a problem and solve it in the moment. 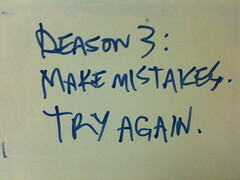 Reason 3 is to remind you that some times you can just throw out your mistakes, erase the board, and start over. So there’s the blueprint for my creative process. Think in real time. Pictures > Words. Make mistakes and try again. This actually maps well to other forms of making content, including writing, speaking, and collaborating. The better able you are to suggest the smallest big idea you know how to do, start working on implementing that idea, and then throwing out when it’s clear that you’ve measured it and it doesn’t work, the better you’ll be able to germinate and build new ideas, sparking your creative process. Give it a try! I’d love to see your whiteboard drawings. I found this post from Greg’s post linked in the comment above. I graduated from Williams in 2007. ICERM (the math institute at Brown University) has an expanse of whiteboard wall in its collaborative space. It is awesome, as you can see in the above picture. Diana – love it. It makes me wonder if there is a blog / tumblr/ resource that shares beautiful whiteboard pictures.